Today, we are using materials you probably have at your home such as ☕️coffee filters and markers to conduct this amazing chromatography tie-dye color mixing walking 🌈 rainbow experiment! water (see tips 👇🏻 below). Invite your child to draw a large circle at a base of a coffee filter. Do the tracing over scrap paper or a newspaper as the markers bleed through. By tracing just the base-circle, your marker will not bleed too fast otherwise turning the whole filter one color instead of tie-dye! Fill glasses with a little bit of water (about an inch). The way you fold is important❗️Fold your coffee filters in half. Fold each filter for the third time ~this will expose the white un-markered center at the point. Insert folded filters into jars/shot glasses. The water travels fast ~ within few minutes, you will be seeing the result of the process called capillary action! Capillary action is a process during which liquid, like water, moves up into a material with a lot of small holes (like paper ~ coffee filter). Capillary action happens when three forces called cohesion, adhesion, and surface tension work together. In other words, capillary action occurs because water molecules bond together due to forces of cohesion and adhesion as well as stick to other substances such as paper (coffee filters). The surface tension acts to hold the surface intact. Capillary action occurs when the adhesion to the surface material is stronger than the cohesive forces between the water molecules. Adhesion of water to the surface of the material (coffee filters) will cause an upward force on the liquid (water). Notice, that the remaining (non-absorbed) water in glass jars remains clear! A voila! A beautiful 🌈rainbow! ⌛️30 minutes later ~ do you see the tie-dye effect! Purple was Julia's favorite, while blue was Adrian's choice! 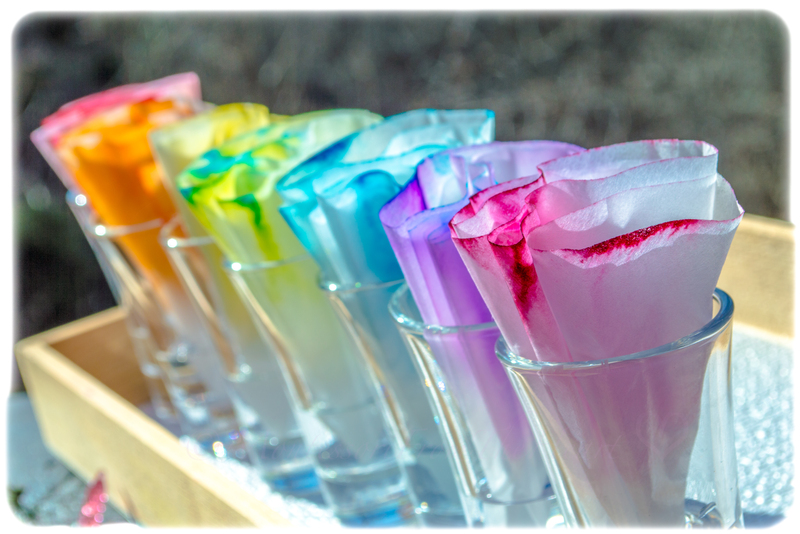 Once the capillary action is completed (30-40 minutes), take the filters out of the water and let them dry. I suggest air drying filters first until the colors settle (clothespins do the trick!). Otherwise, the color from filters will transfer to the drying surface. After about ten minutes, we had rainbow coffee filters to create a craft with! What to do with these beautiful rainbow filters? 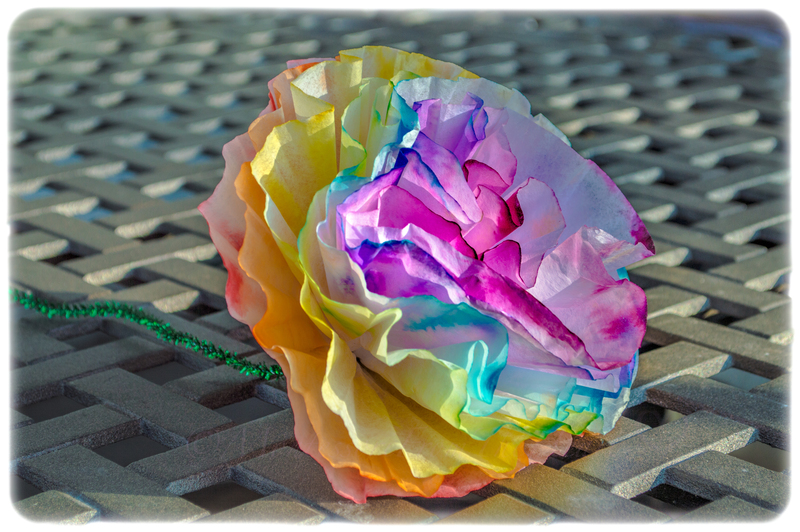 What about a rainbow flower! Just fold each filter from the center, crinkle it individually and hold all the filters together! Or, insert a green pipe cleaner at the center of a filter, threading it through, then thread the next filter, till all filters are on a pipe cleaner ~ tie the tip of the pipe cleaner in the center and crinkle the filters up. Rainbow flower! This can make a perfect💐Mother's Day🎁Gift too! We did a similar flower craft when Adrian, as a tribute to Van Gogh's Birthday, made 12 🌻Sunflowers Tissue Paper Recycled Cardboard Roll Paper-Mache Craft (see 📽️ a video of him making it here). 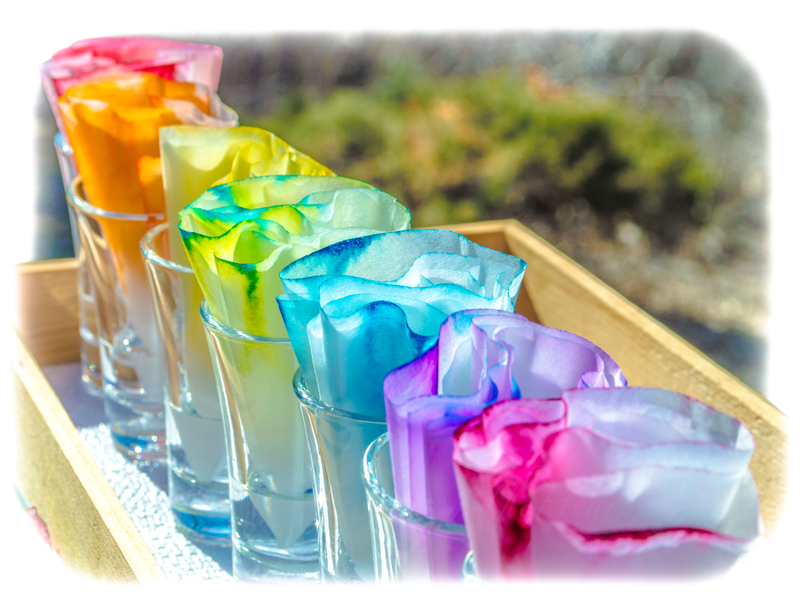 For more on capillary action, see here 💛💙❤️Primary Colors, 💦Water & Paper Capillary Action ⌛️Timelapse ⚗️ Kids Science Experiment (🌈 Rainbow Walking Water). For more on color-mixing, please see here "🎨Painting with 🌈Colored Vinegar on Baking Soda Science Experiment 🔬 💡⚖️ 101 🎥 Series 🎇," and here " 👔 Father's Day🎈Balloon Color-mixing DIY Craft (Sensorial 🖐️👀👂👅👃 Activities 101 🎥 Series 🎇)." For more on science experiments, see here a video-post "Float or Sink❓Tangerine 🍊 Science Experiment (Science 🔬 💡⚖️ 101 🎥 Series 🎇)." Also, see here "Walnut Shell ⛵Sailboats 💦Water Science Experiment (Science 🔬 💡⚖️ 101 🎥 Series 🎇)." And here a video 🌋 Erupting Volcano Science Experiment 🔬 💡⚖️ 101 🎥 Series 🎇.